A miniature silver vessel of archaic bronze fang ding form, the rectangular body supported on four straight feet with bovine heads. The flat everted rim has two loop handles. The body is decorated with four vertical notched ridges at the corners. A decorative band adorns the upper section of each side, which is engraved with two stylised birds separated by a raised ridge. The flat base of the vessel bears two marks: Chun Yin (‘pure silver’) and Mei (‘beautiful’). These delicately made miniature silver vessels, truthfully representing their archaic bronze prototypes that date from the Shang (16th century- c. 1046 BC) or Zhou dynasty (c. 1046 – 221 BC), were probably intended for the local Chinese market. During the Qing dynasty (1644 – 1911), collectors are said to have devoted much time to amassing miniature treasures, which they kept in curio cabinets that were fitted out with a series of small compartments. Miniature bronze vessels, many inlaid with gold and silver, were appreciated and treasured by collectors. Such miniature silver pieces might have served the same function, being appreciated in scholar’s studios. 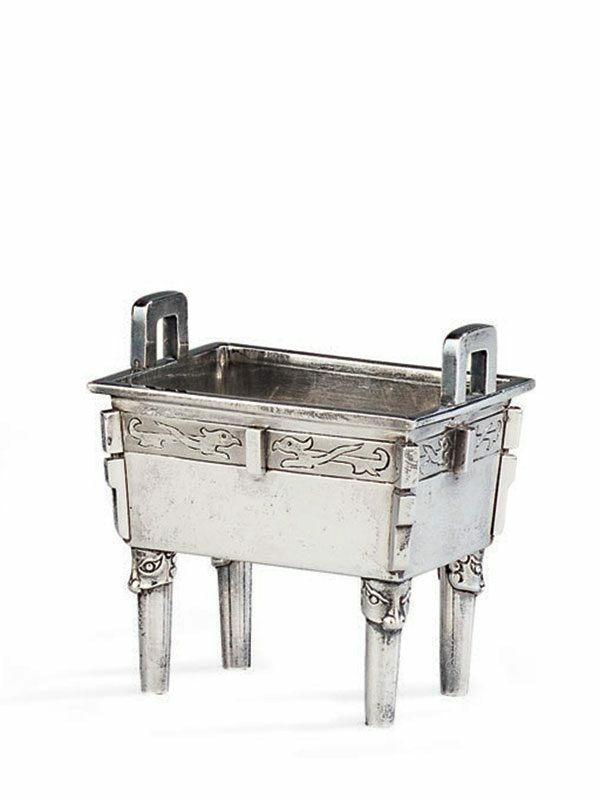 A comparable but much larger silver filigree incense burner of archaic fang ding form, dated to the first half of the 18th century, is in the collection of the State Hermitage Museum in St. Petersburg.